Nearly every commercially made sauce, soup, ice cream, cookie and cake contains soy lecithin -- an odorless, flavorless, powdered derivative of soybean oil. Soy lecithin works in so many foods because it's a powerful stabilizer, preservative, moisturizer, emulsifier and thickener. Unlike starch thickeners, soy lecithin activates at any temperature and dissolves on contact so you can use it with both water-based soups and sauces and fat-based emulsions such as mayonnaise, hollandaise and vinaigrette. Lecithin isn't just for big food companies, either. 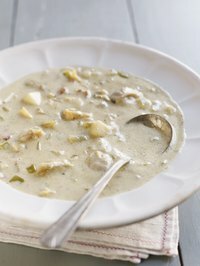 You can save the flour and cornstarch and use lecithin to thicken homemade soups and sauces. Cook the sauce or soup until you have all the ingredients added and cooked through. Measure 1/2 teaspoon of soy lecithin per cup of soup or sauce. Sprinkle the soy lecithin over the surface. Whisk the lecithin into the soup or sauce until thickened, about 30 seconds to 1 minute. Season the sauce or soup to taste. Add the emulsion's ingredients to the mixing bowl or food processor. For example, if making mayonnaise, add the oil, egg yolks and vinegar to the mixing bowl or food processor. If making hollandaise sauce, add the butter, egg yolks and lemon juice to the mixing bowl or food processor. If making a vinaigrette, add the oil, mustard and vinegar to the processor or mixing bowl. Measure 1/2 teaspoon of soy lecithin for every cup of fat used in the emulsion. Sprinkle the soy lecithin over the surface evenly. For example, when making mayonnaise or vinaigrette, add 1/2 teaspoon of lecithin per cup of oil; when thickening a hollandaise, add 1/2 teaspoon of lecithin per cup of butter. Blend or whisk the ingredients until emulsified. Emulsions form in about 20 to 30 seconds when using soy lecithin. Season the emulsion to taste. You can find soy lecithin at health-food stores, online retailers and some supermarkets. Xanthan gum increases the thickness and stability of soups, sauces and emulsions made with lecithin when you use a 2-to-1 ratio of soy lecithin to xanthan gum. Add 1/4 teaspoon of xanthan gum for every 1/2 teaspoon of soy lecithin and stir. Water-based sauces and soups include those that use stock or broth as the base. Can You Thicken Cooking Juices With Almond Flour?